With more than 50 tasty recipes at your fingertips – hot and cold, sweet and savory, even vegan and gluten-free – eating smart has never been easier or more irresistible! Rachel S. Beller (America’s “Get Real!” Nutritionist) wants you to drop those juices and grab a spoon.That’s because the hottest thing in nutrition today is souping — as in big, satisfying bowls filled with power ingredients. 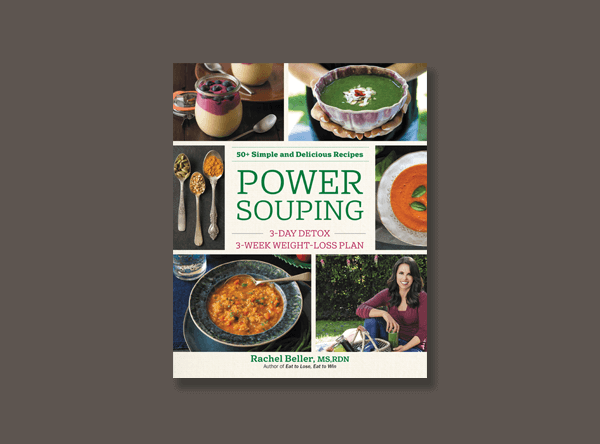 Unlike juicing (which is so ten years ago), Power Souping’s easy-to-make recipes deliver the fiber, antioxidants, and essential nutrients – all without taking you for a blood sugar roller coaster ride. Once you’ve completed these action plans, Rachel gives plenty of maintenance tips to keep you in the game. Power Souping will change the way you think about what you put in your body. And with more than 50 tasty recipes at your fingertips — hot and cold, sweet and savory, even vegan and gluten-free — eating smart has never been easier or more irresistible.